Can you buy a full set of cartridges for the Brother MFC J625DW printer? Are the ink cartridges shown here for the Brother MFC-J625DW printer also compatible with the Brother MFC-J615W printer? When there are so many options to sift through, even in a single range of printers, it can be a challenge figuring out what benefits one printer might have over another. Well, the Brother MFC-J625DW might have gone a little unnoticed of late, but in order to ensure that you pick the best option for your specific needs and requirements, you'll need all the facts; hence this brief review of the Brother MFC-J625DW. There is plenty to mention about the design of the Brother MFC-J625DW wireless colour inkjet all-in-one. In simple terms, this printer fits pretty much entirely with the many home printers as it boasts the same stylish black finish and angled corners which have helped make this range as popular as it is. Technically speaking, there is a very pleasing user interface included. The Brother MFC-J625DW inkjet does boast many key features which help to give it its own personality. 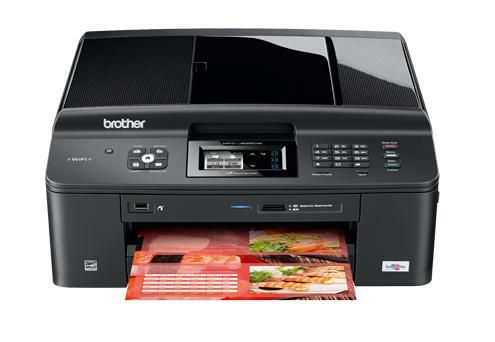 The Brother MFC J625DW offers high quality print-outs, something which really can make or break a printer in truth. Thankfully, results created with the Brother MFCJ625DW are up there with the very best, making this a very reliable and impressive item. There are none to speak of really. The Brother MFC-J625DW colour inkjet multifunction printer is yet another fine example of just how effective such a home printer can actually be these days.